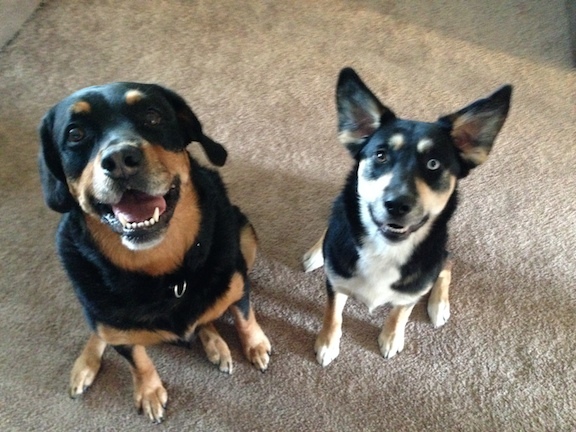 Ratchet is a seven-year-old Rottweiler, pictured here on the left with Malibu, an 11 month old Husky mix. I was called in primarily to work with Malibu who jumps up on people, steals food, gets on the furniture, plays too rough with Ratchet and doesn’t listen very well. When I arrived for the session Ratchet barked a few times and the investigated me with his nose in a pretty normal way. Malibu on the other hand bounced around, barked, jumped up, did circles, was panting and was clearly over excited. When I sat down to speak to their owner about the session, Malibu jumped on on the couch and sort of ran all over it, paying no mind for her owner’s personal space or corrections. I suggested a way to disagree with Malibu’s jumping on the couch; standing up and sternly saying off before pushing the dog to the edge of the couch so it nearly falls off and instead jumps down on its own accord. Normally this is a correction you only have to repeat a few times before the dog gets the message. Not Malibu. After correcting the dog over a dozen times this way, she continued to jump right back up on the couch and was very over excited. I grabbed a leash and put it on Malibu, then stepped on it about 12 inches away from her collar to reduce her ability to move away. After protesting a bit, she sat, then lied down and got much calmer. After a minute or two, she was completely calm and no longer trying to jump up on everything. Once she was in this calm, balanced frame of mind, I took my foot off the leash but didn’t make any other movements. Malibu stayed laying on the floor with a nice energy level. I suggested that her owner repeat this process every time the dog’s energy level got too high. By consistently giving the dog a “time-out” each time it gets over excited, we can communicate that over-excitement results in a loss of freedom until the dog returns to a calm state. It will require consistent application of the time out technique over the next few weeks, but over time it will result in a dog who is better able to and more consistently controls itself. I showed their owner a few exercises that will help the dogs learn to focus better and give Malibu practice at calming down. I also suggested a few new rules to incorporate to help Malibu see herself as below the humans in terms of rank and authority. Because Malibu was digging holes in the back yard and chewing on the wood fence, we went outside to take a look. The holes here against the fence line which was undoubtably the dog’s attempt to get to the neighbor dogs. I advised them to fill the holes back in and add a little of Malibu’s poop about an inch below the surface. This usually stops a dog from digging in the same place again. Because Malibu is a puppy, I advised her owners to leave some assorted sticks and branches out in the back yard. Puppies have an insatiable desire to chew to set their adult teeth so its important we provide appropriate items to chew on, lest the dog find something on their own as Malibu did with the wood fence. I also suggested they get some outdoor toys for her to play with. Her digging is also likely impacted by boredom so providing her with items that can engage her will help eliminate the need to chew on the wood fence. By the end of the session, Malibu’s energy level was much lower and her response to commands and corrections was much better. By practicing the new techniques, enforcing the new rules and giving her a time-out when she gets over excited, Malibu’s problems will quickly become a thing of the past.